MS Outlook Recovery Tool is designed mainly for Outlook users for solving their issues while accessing it. It helps to recover deleted items from Outlook 2016 / 2013 / 2010 and below versions seamlessly and export it to PST, EML, MSG and HTML . Repair Outlook database for both Minor as well as Major corruption. Supports to Repair MS Outlook PST files in batch mode. 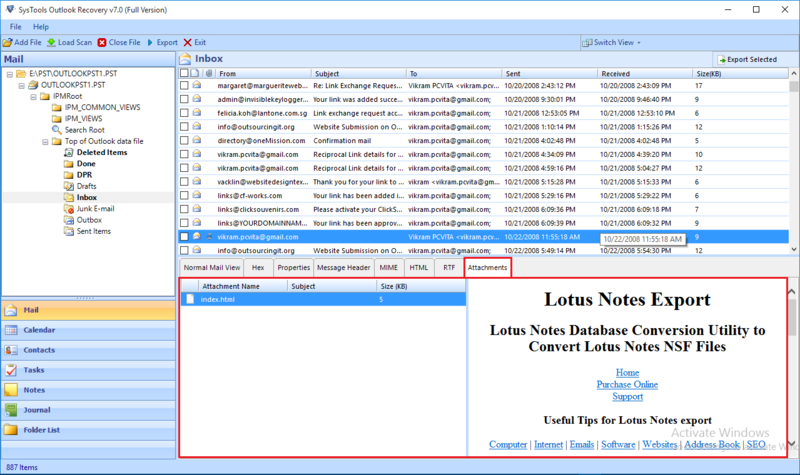 Software Recovers & View the permanently deleted items of Outlook. No limitation on file size, supports to Unicode & ANSI PST type. 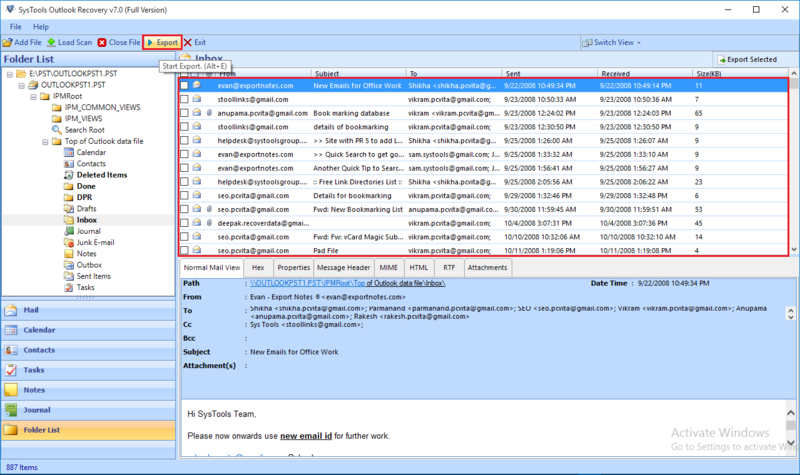 Apply Date Filter & Emails to recover and save selective data of Outlook. Microsoft Outlook recovery tool support to recover password protected files. Recover MS Outlook archive data without installation of Outlook application. Option to save recovered data in PST, MSG, HTML and EML and Office 365 file type. This Microsoft Outlook data recovery software is helpful to repair the corrupted and hard (permanent) deleted emails, contacts, calendar, journals, tasks, notes. For highly corrupted file, you’ll need to use Advance mode. Outlook Recovery Wizard will give the preview of all emails of selected file along with its associated attachments. It also provide the preview of all other recovered Outlook data items like contacts, calendar, journals, attachments. MS Outlook Recovery tool has two repair modes: Quick and Advance Scan Mode. In case of damaged Outlook archived PST or scanpst bak file, automatic scanning occurs. Advance scan mode is used when Outlook file is highly corrupted. Multiple Outlook PST files can be repaired at a time using Microsoft outlook Recovery. These files can be browsed from the local system location. For selecting files to repair, the tool gives the option of Search all & selected drive for easy selection. 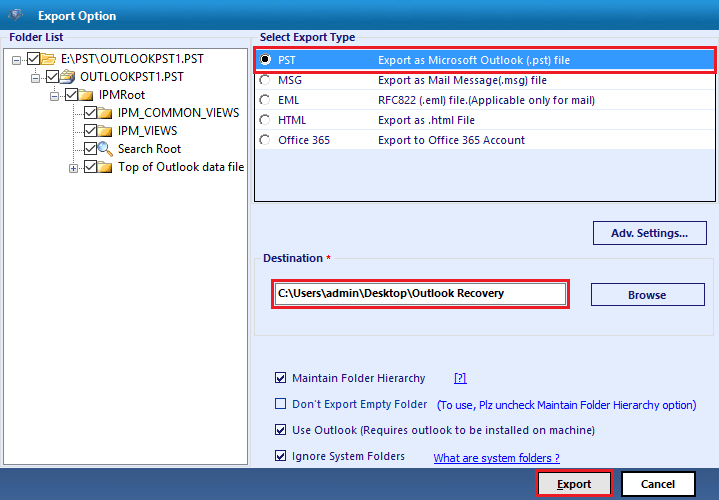 After completion of MS Outlook Recovery, the recovered data can be saved in either in the same format i.e .pst or it can be saved in .msg or .eml file and .html It allows users to open the Outlook data in other platform such as Windows Live mail and many more. Microsoft Outlook Email Recovery Software has the feature to save the emails in the multiple naming convention. It helps to access emails in a more concise manner. This option will be given when the user saves the recovered data either in .msg or in .eml file format. By using Microsoft Outlook Recovery software, the users also has options to save the multiple PST files into account. It will allow you access the database of Outlook anywhere, any time through the web. Email Filter Option to save file. The tool provides the filtering feature which allows to save the selected recovered data only. Set the date range between which you want save the Outlook emails in either .pst, .msg or .eml file formats. 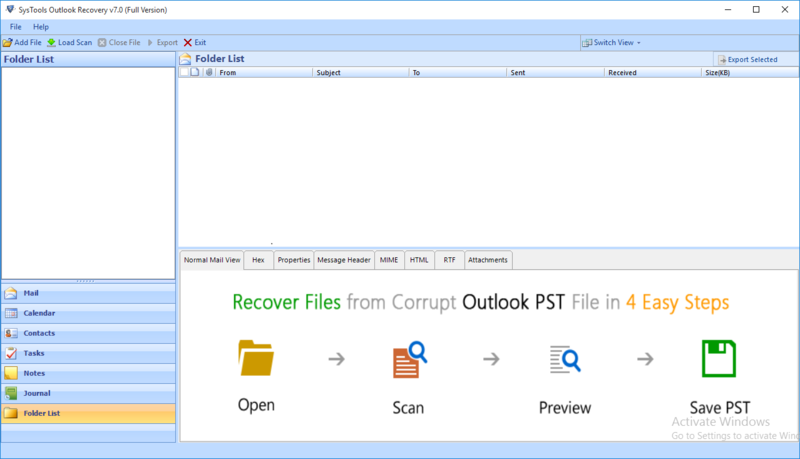 Outlook PST Recovery Tool after complete recover deleted items from Outlook 2016, 2013, 2010, 2007 will generate the report containing details like source file, success count, fail count. User can save this report in their local system. Using Microsoft Outlook Recovery tool, users can repair the unicode PST files from all versions of Outlook 2016, 2013, 2010 and all earlier versions. The tool is compatible with Windows editions 10, 8, 7 and older. "I had lost my data because of hard deletion and was looking for the solution to recover the permanently deleted items from Outlook. 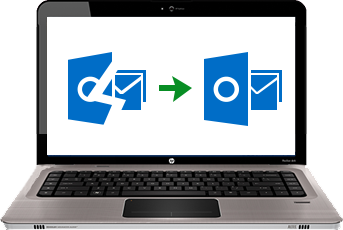 MS Outlook Recovery tool has been proved to be useful in this case as it helps to restore all my deleted emails again." "I would like to appreciate the development team of Securasoft MS Outlook Recovery Software as it is the best application to repair the highly damaged Outlook PST file. And saves the recovered data in a fresh file." "To recover deleted items from Outlook 2016, I have found a finest utility named as Microsoft Outlook Recovery software as it repairs the data completely with no data loss and maintaining the data integrity." "MS Outlook Recovery Tool is an excellent tool as it helps me to recover the large and corrupted PST file. I would recommend this software to all who are suffering with the PST corrupted file issue." MS Outlook is a desktop based email client widely used for emailing purpose. Apart of this, it has many other features such as contacts, calendars, journals, notes. It stores its database in a file with extension .pst. It is called Personal Storage Table. Any type of physical damage to the sector in which the PST files exist it may leads to the corruption in Outlook database file PST. If MS Outlook has been shutdown abruptly which does not save the data in a PST file correctly. On starting the application next time, some discrepancies may be seen there. If the outlook PST file becomes heavy and large enough for storing more data. This type of file is more prone to be corrupted. malware or virus entry may corrupt the file database. It is recommended to install an effective antivirus software to prevent virus attack. Due to the above listed cause of PST corruption, Outlook users become unable to access their database. Outlook Recovery software repairs these corrupted database files quickly and save them into new fresh file. It also act as a hard deleted email recovery as it restores the permanently deleted items from Outlook 2016 / 2013 / 2010 and all earlier version.